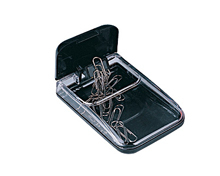 A clip box is an office product used to hold clips. Deli clip box, made of superior material, is not only stylish, aesthetic, but also functional and convenient to use. With our clip box, you will never have to worry about where to place you clips anymore. As an ISO9001:2000 and ISO14001:2004 certified clip box manufacturer in China, we at Deli Stationery provide an complete line of office supplies, including clip box, file holder, stapler, paper trimmer, whiteboard, fax paper, calculator, and more. High quality, great reliability, no pollution, and ease of use have made our products increasingly popular with students and office workers. We are certain you will be satisfied with our products and service. Our staff looks forward to working with you. Paper Shredder2. Longer paper-inlet. and paper deflector is equipped. 3. Nitrogen treated steel knife is installed in our paper shredder. 4. Deli paper shredder can continuously cut papers for 15 minutes. Laminator2. Stable laminating: no bubbles and no deformation. 3. High speed reheating, heat output and laminating. 4. Environmental protective and energy saving. Low noise.